Where? North-east corner of Red Lion Square, connecting through to Theobald's Road. What? Pleasant diagonal, taking in quaint eateries and not-so-quaint pink flats built on heavily war-damaged land. 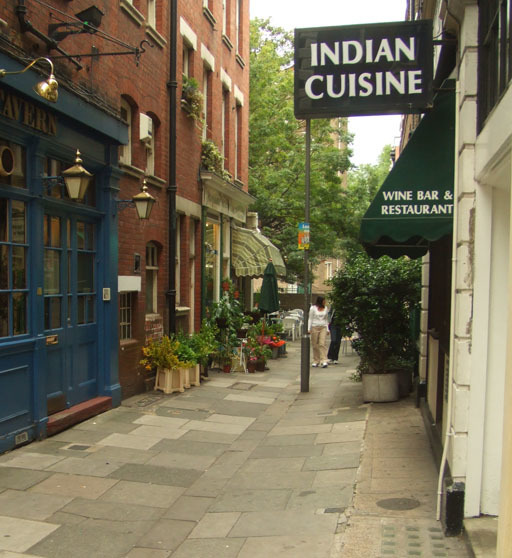 Formerly called Little Conduit Street, the passage takes its name from a water channel built by the philanthropic William Lamb in the 16th century. Originally, similar alleys existed at all four corners of the square, but road alterations have removed most traces of the other three. Why use? Another one with a good pub, this. The Dolphin at the Theobald's Road end is a pokey smokey kind of place, with a high proportion of regulars. It also boasts a haunted clock, which was pulled from the rubble when the pub was destroyed in WWI. The opposing Enterprise is also worth a visit. Also good for? A particularly quirky bookshop that keeps very strange hours and an eminently browsable stock. Also, check out Conway Hall at the Red Lion Square end. This 'hub for free speech and progressive thought' is London's spiritual home for morality and ethics. Not so progressive in its interior decorating, though.